The Belgian capital, Brussels, is a cosmopolitan city: a quarter of its population is foreigners. Its Jewish population is similarly diverse. Before the war, the Jewish quarter was located in the boroughs of Anderlecht and Schaerbeek, close to the two main railway stations. This demographic concentration unfortunately facilitated the work of the Nazis during their roundups. At the intersection of rue Émile Carpentier and rue des Goujons, you will find the National Monument to the Jewish Martyrs of Belgium. The names of 23838 victims are engraved in the stone. The square on which its stands has been renamed Square des Martyrs Juifs (Square of the Jewish Martyrs). Brussels is the seat of the Central Israelite Consistory of Belgium, which represents Belgian Judaism. 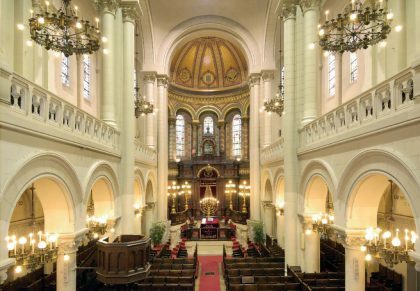 The Grande Synagogue de la Régence, built circa 1878, stands next to the Royal Conservatory and not far from the law courts. The rather conventional facade gives no idea of the dazzling majesty of the interior nor the size of the organ. This traditional community meets on Saturdays and for the main festivals. The male choir and the cantor are renowned. Note that none of Belgium’s synagogues have permanent wardens, but they can be visited by appointment. English-speaking Jews, most of them working in the city’s European institutions, form a fifth of Belgium’s Jewish community. They attend Shabbat services with Liberal French-speaking Jews. The Beth Hillel Synagogue is strongly attended during Jewish festivals. Egyptians, Moroccans, Syrians, and Iraqis meet at the Sephardic Synagogue, which is small but very congenial. Directed by Michel Dratwa, a learned authority on the Jewish world, the Jewish Museum of Belgium has a large collection of ancient and modern documents illustrating Jewish life. The objects exhibited come from Europe, Africa, and Asia. This permanent exhibition is designed to be educational and follows the chronology of the Hebrew calendar. The rites of passage -birth, marriage, and death- are clearly illustrated . 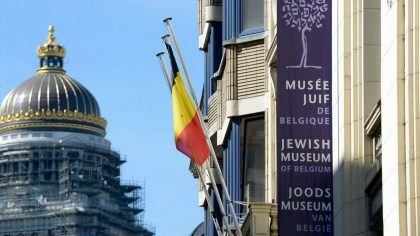 In order to provide the Belgian capital with a fitting site for Jewish memory and history, the museum has been given a prestigious annex, a building housing a major Centre of Belgian and European Jewish Art and History. The Nazis used barracks as assembly camps for the Belgian Jews. Between 1942 and 1944, 25267 Jews were imprisoned in the camps before being sent to Auschwitz. The Jewish Museum of the Deportation and Resistance is presented as a kind of antechamber to death -which in effect it was. It presents the history of the Final Solution and the deportation of the Belgian Jews, half of whom never came back. It pays tribute to those Belgians who saved thousands of Jews, including 4000 children.